My flight to Japan was a remarkably comfortable one. Last week saw me in the sky for over 70 hours and thoughts of DVT played heavy on my mind as I got ready for the last leg of a rather mammoth few days. 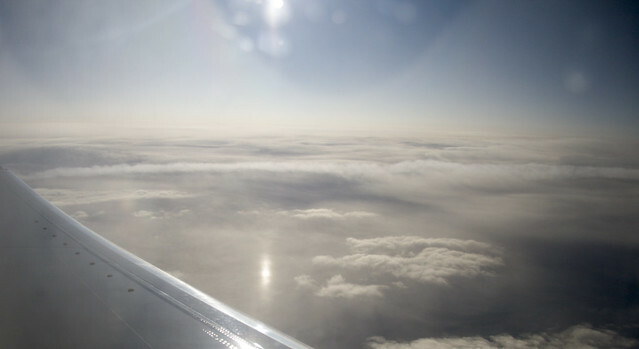 Days that I would however repeat, travel included, given the chance. Thankfully on changing at Amsterdam airport the ground staff took pity on my grizzled face and booked me into a seat with two spares next to it so I could finally stretch out. I managed a couple of hours sleep on the 11 hour journey which is not a bad proportion for me, given that I normally manage none at all. After a recent flight where, on asking for a whiskey, I was presented with a good half pint of the stuff, I have been staying away from alcohol on flights. The whiskey did knock me out, but it also gave me a horrendous hangover for the waking hours of the journey. Anyway, I was up to watch the sunrise over China and managed to see the faintest of green flashes, though sadly didn't get it on camera this time. Later on in the flight however as we neared Japan the air at 30,000+ ft became filled with ice clouds and the interplay of light and ice made for a truly spectacular display. This time however the display was a lot more complex. The column crystals in the clouds around us caused a 22 degree halo while the plate crystals gave a faint sundog (also known as a parhelion). In the thick clouds below however things got more interesting. The plate crystals below gave an effect that I'd never seen before. Not only did the light refract as it was passing through the sides of the crystals, but it also bounced off the bottom face, and back up, acting like a mirror to give a so called subparhelion. 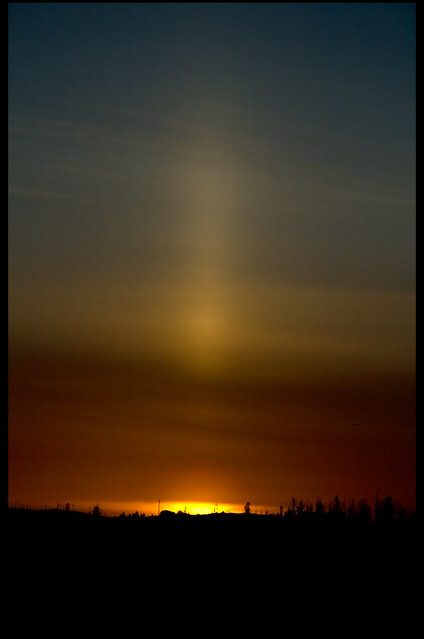 Moreover, because of the high density of crystals in the lower layers there was a strong 46 degree halo coming from a rather rare dynamic of light through the end of column crystals. It seems that this may not have been photographed before. The reason that the circle around the sun is so distorted is because it's from the edge of a very wide-angle lens (Sigma 10-20mm at 10mm). The 46 degree arc in the clouds below seems to be an extremely rare event and the infralateral arc is also something rather special. All in all one of the best halo displays I've ever seen. 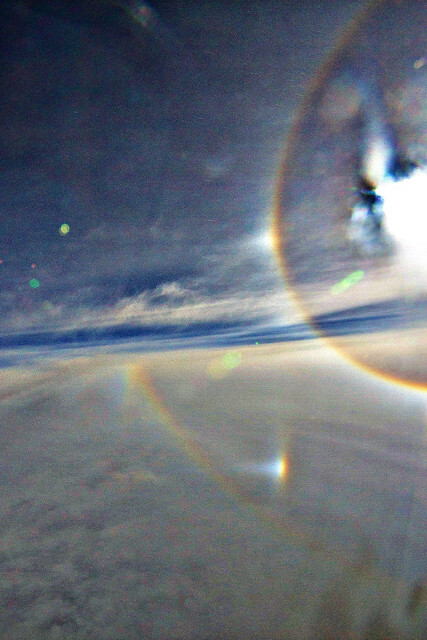 I've seen halo displays a few dozen times when flying now. Take some sunglasses with you, look out the plane and see if you can spot them next time...they're are there to be marveled at. You can calculate the angle by looking at how light travels through a hexagonal ice crystal. It's a matter of the refraction of light through an ice/air interface. 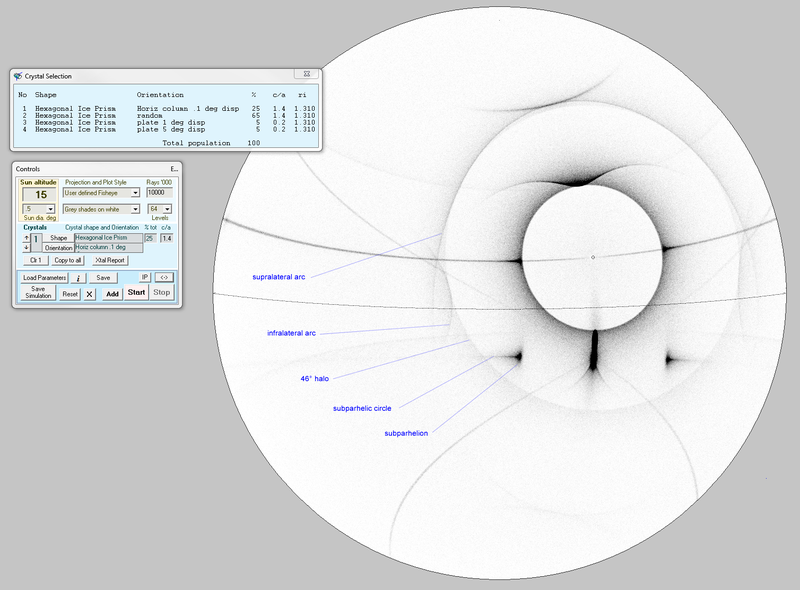 It ranges from about 21.7 to 30 degree deviation from straight through, most of it come out at about 22 degrees. That is why the angle subtended between the sun and the halo is 22 degrees from the point of view of the observer. I can point you to some diagrams if that would be useful.